Of course, this can only be my personal subjective view, particularly as I have actually only tested a few browsers including OmniWeb, Stainless, Safari, Chrome and Chrome Canary. In particular, I have not looked at Firefox as I really have never liked it. It's main feature, the millions of extensions, just do not excite me. I want a browser essentially just for light browsing and the main features I need are speed, speed and did I mention speed? I don't want a browser so overloaded with features and extensions that it becomes lethargic. One thing that makes a browser fast is the availability of a favicon-only bookmarks bar which is colorful, yet minimalist and let's you very quickly browse to all of your favorite websites with just one-click. I had used OmniWeb 5.11 for quite some time mainly for this reason, but it didn't seem to be compatible with Lion as it crashed quite a number of times on me. Seems we have to wait for OmniWeb 6 before 64-bit compatibility is available. Safari 5.1 is fast and has the full-screen capability that is a major feature of Lion but it does not allow favicon only bookmarks. See this thread that's been running for 5 years begging for this in Safari. Further, its minimalist approach, although much loved by Mac fanboys, just doesn't appeal to me. Stainless has a lot to like but is a bit too much like Safari in its minimalist tabs. Opera, which I used to love, particularly when it introduced speeddial, just seems so old-hat to me now that I didn't even look at it in Lion. Google's Chrome is impressive but strangely runs into a CPU overload when I try to run Blogger which is where I'm writing this blog. 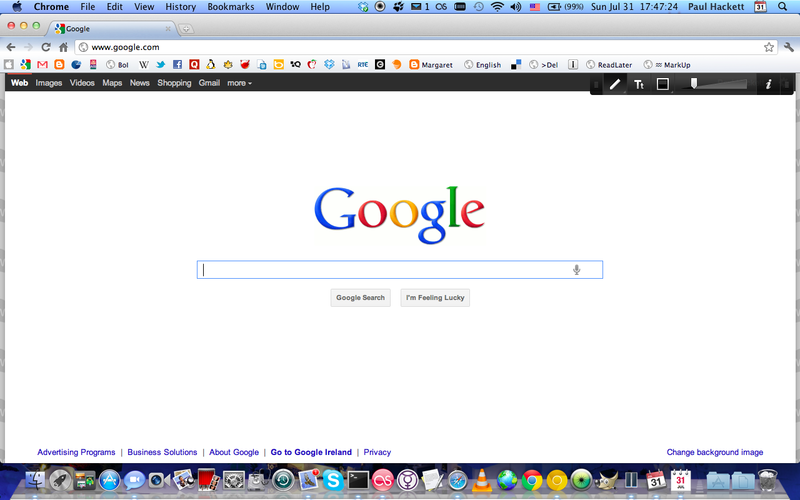 what I've chosen as my preferred browser in Lion. One thing I didn't like about Chrome or Chrome Canary is that you cannot configure a new tab to open on your preferred page. However, the New Tab Redirect extension does. The screenshot shows Canary and how it looks for me. I was using the voice-enable capability in Chrome although it didn't work so well for me. But this could really be something very interesting for the future. However, I haven't yet managed to get it working in Canary. One other thing I didn't like in Chrome (and Canary) is that when you click a link to open in a new tab, focus doesn't follow to the new tab. I thought it would be pretty obvious that if you went to the trouble of opening a link, it's because you wanted to look at it NOW, not later. Luckily, if the link is opened with the middle mouse button while holding down the shift key, focus will shift to the newly opened tab. Works but just a bit too complicated. I feel pretty much the same. I don't really understand why so many people are "Obsessed" with Firefox when, in fact, it's not even close to Chrome's speed!